Ty is a 5th grader at Mae Richardson and enjoys being amongst the “grown-up” twelve-year-olds. He was born three-months early, on July 25, 2006, weighing just two pounds. Right after his birth, this little baby boy had two bilateral strokes that led doctors to believe he would most likely be in a coma-like state for the rest of his life. He was placed on life support and spent the next 9 ½ months in the NICU. Ty was a living miracle and was overcoming many medical obstacles, although not out of the woods by any means at that point. By the time he went home for the very first time, he was on a ventilator and constant oxygen, he had a G-tube, and he had a tracheostomy. Ty suffers from the aftermath of having multiple strokes, he has hydrocephalus, and a condition called chiari malformation. Hydrocephalus is excess spinal fluid around the brain and chiari is an abnormality that affects the lower part of the brain, the cerebellum. Ty also has autism and suffers from cognitive, gross and fine motor delays, as well as speech disorder, anxiety, and seizures. Ty’s family must travel to Portland often for medical treatment. Currently, doctors are in the discovery phase of some recurring seizures and a possible diagnosis of cerebral palsy. 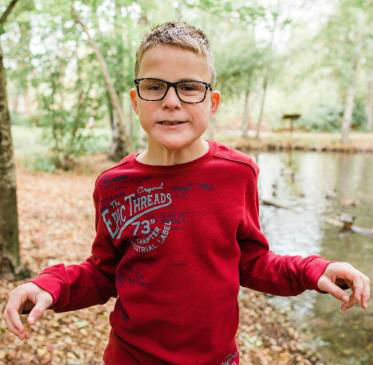 Although Ty’s life has many medical challenges, he is full of happiness and love. Ty has a wonderful sense of humor, he is very kind and intelligent, and he loves his friends and family. Ty will be adopted as a Sparrow to Mae Richardson School. Students at Mae Richardson will work hard to raise money for Ty through sponsored community service and fundraising projects.